As you know, the Epcot International Food & Wine Festival is currently in full swing. 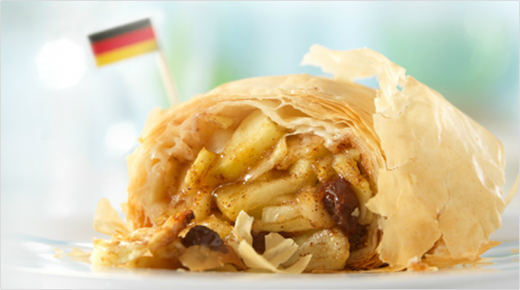 One of my favorite treats from the Festival is the apple strudel from Germany- my mouth is watering just thinking about it! If you're a fan of this flaky delight, get excited- because today I'm sharing the recipe so you can savor Germany's apple strudel at home all year round. Gently mix apples, raisins, sugar, and cinnamon in a medium bowl; set aside. Toast bread crumbs in a small saute pan over medium heat. Stir constantly until golden brown, about 5 minutes. Transfer to a small bowl and let cool. Place a kitchen towel on a large work surface. Spread one sheet of phyllo dough on the kitchen towel and lightly brush the entire surface with melted butter. Layer another sheet on top, butter, and continue the process until all sheets are stacked. Sprinkle the toasted bread crumbs along the longest side of the top sheet of buttered phyllo dough. Spread apple mixture on top of the bread crumbs. Roll the strudel, jelly-roll fashion, using the towel to help shape the dough, starting from the apple mixture side to the opposite end. While rolling, make sure that apples do not spill from the ends. Place seam side down on baking sheet and brush with remaining melted butter. Using a large spatula, place strudel on an ungreased baking sheet. Bake approximately 25 to 30 minutes or until the dough is golden brown. Let cool at room temperature for 30 to 45 minutes. Slice strudel with a serrated knife into 6 portions; top with whipped cream, if desired.